This is just about all of the hand sanding gear I use in my shop. I present this in the hope that you will find a useful tip or two. 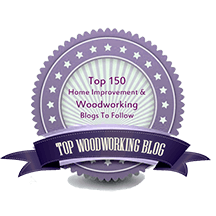 A cork block, 1″ x 2″ x 3 7/8″, is the best tool I have found for hand sanding. It has just the right compressibility and resilience to produce a consistent and true sanded surface, and it feels comfortable in the hand. A piece of cork glued to a wooden block is a decent substitute but not as good. Almost all of the area of one-third of a standard 9″ x 11″ sandpaper sheet can be utilized by re-wrapping it just once. 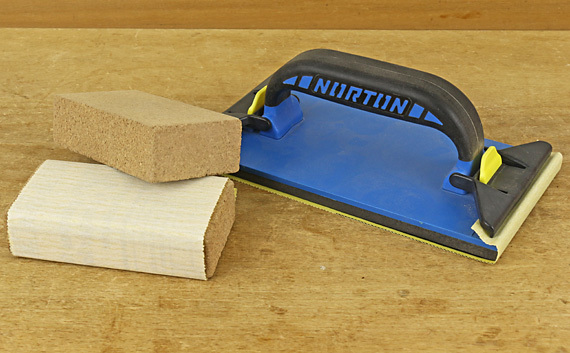 The Norton pad gets less use but is handy for fine sanding large areas. It uses the same one-third sheet with little waste. Convex and concave rubber sanding grips are handy, though I more often use ad hoc blocks made from combinations of wood, cork or rubber sheet, and pink foam insulation. Some of these are worth preserving but some live for only a single fleeting employment. The sheet cutter makes it almost fun to size sandpaper. A hacksaw blade is screwed to a piece of plywood with enough slack to permit the sheet to easily fit under. A piece of thin plywood is glued to the blade to make it easy to press the blade firmly onto the back of the paper prior to tearing it. 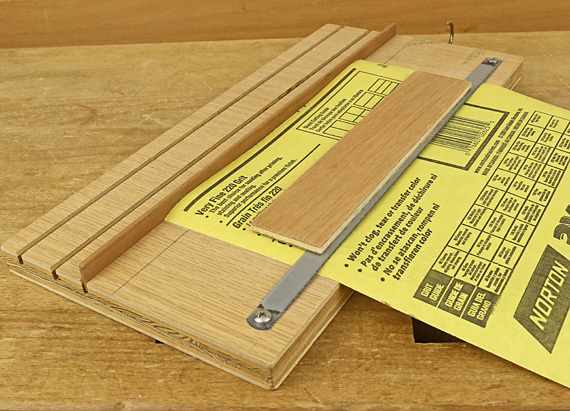 A slat is placed in one of the table-sawn kerfs that have been placed to yield the desired sizes of paper. By far most common are one-third sheets made by cutting across the narrow width of the full sheet to yield strips about 3 2/3″ wide. This little plastic bucket screwed to the wall is a good place to store partially used strips. 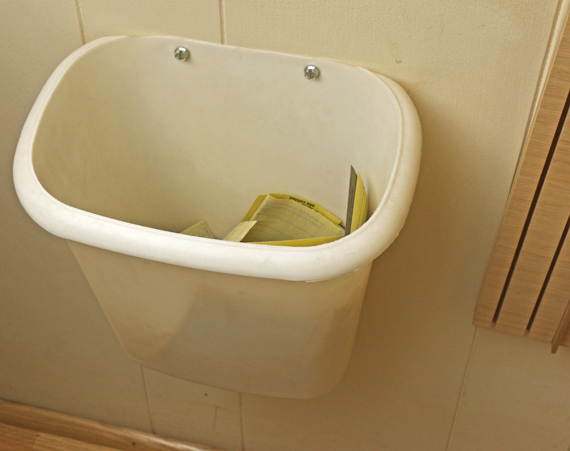 Contrary to comments by some shop visitors, it is neither a garbage can nor a urinal. I’ve used Norton 3X paper for years with excellent results. Norton has superseded it with ProSand, which they claim has more durable abrasive and backing paper, so I will gradually restock with that. 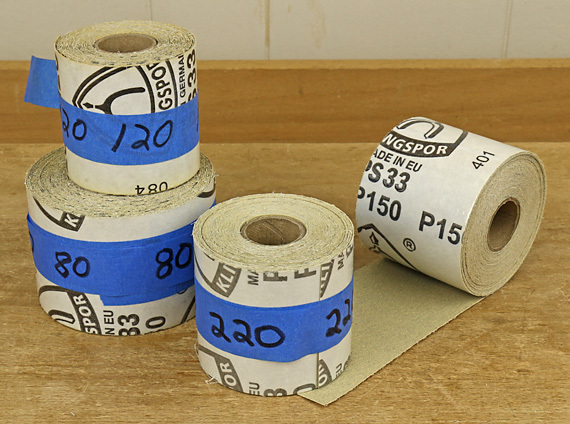 Once you get these 2 1/2″-wide, PSA-backed (sticky) rolls in the shop, all sorts of uses arise. 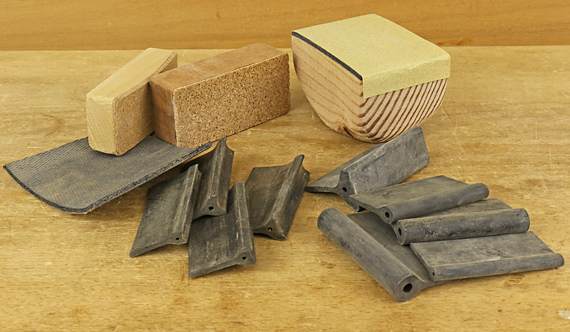 They are great to quickly make impromptu sanding blocks and tools, such as those below. 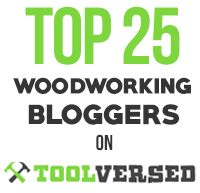 I also reload the Veritas shooting sander with them. 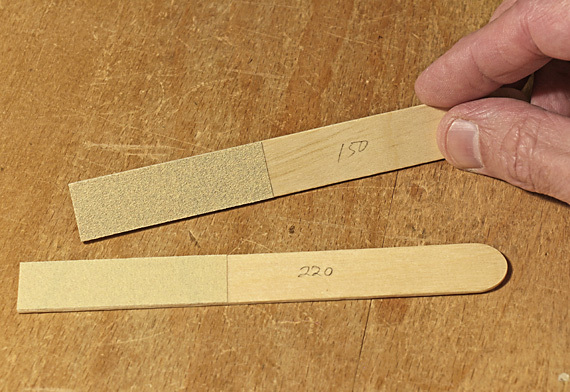 These little shop-made sanding sticks solve vexing detail issues in almost every piece I make. Apply an oversized piece of PSA sandpaper to the squared end of a wooden tongue depressor, and then trim the excess with a utility knife. Of course, as needed, you can also create a V-point or other shape on the end. You’ll wonder how you ever managed without them. 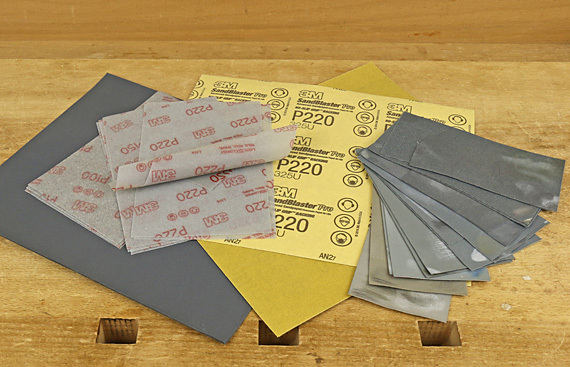 The silicon carbide “wet-dry” paper is there for sanding between coats and sometimes for wet sanding of oil-varnish. I have 600, 1000, 1500, and 2000 in stock but rarely use the finer grits. 3M Ultra Flexible Sanding Sheets, available in 100, 150, 220, and 320 grits, really live up to their name. The grit stays on and the backing does not crease or tear. These are a far better option for contour work than sanding sponges, which I have always found to be useless. You can back up these sheets with whatever you want – contoured rubber or foam, a sponge, or just your hand. 3M has also recently introduced Sandblaster Pro sheets with a grippy back. So far, I have not found an advantage from them for woodworking but they are very handy to flatten tools when simply placed on a granite surface plate. They stay put without spray adhesive or water. 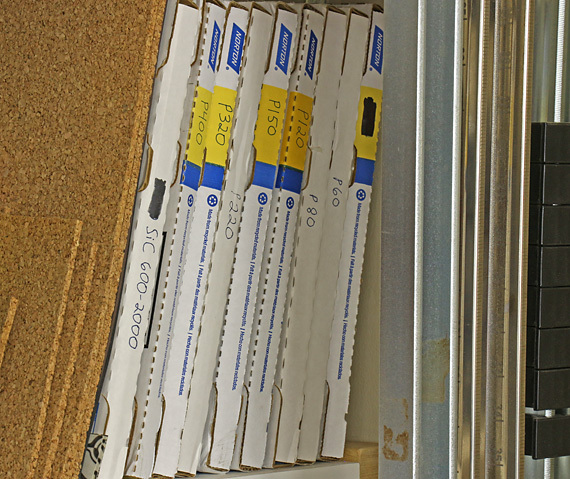 I use the MicroMesh set of 3″ x 6″ sheets for tool and hardware alterations, not on wood. The grit ranges from 1500 to 12,000! The sheets are cushioned and thus not a good choice for sharpening.